Silver Lake water levels are at a 30-year low. Jones River flows are at a 50-year low. Not since the water emergencies of the 1980s has the lake and river been so abused. This is a manmade crisis and it’s totally preventable. Why? Let’s be perfectly clear… we are in a drought. 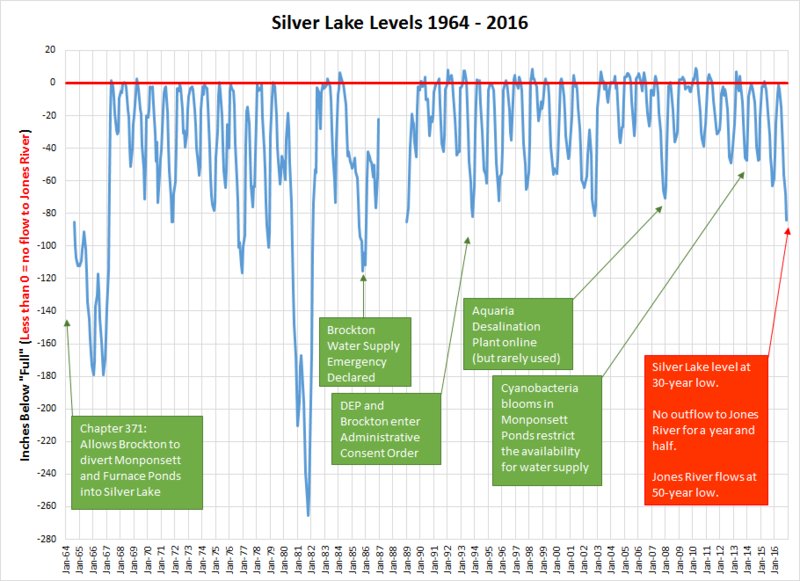 Let’s be even clearer… the severely low levels of Silver Lake are mostly NOT due to the drought. Instead they are the result of decades of overuse and misuse of our regional waters. The City of Brockton takes about 10 Million Gallons per Day (MGD) out of Silver Lake and pumps it 20 miles through 100-year-old pipes. EVERYBODY has ALWAYS known that Silver Lake cannot support the continual withdrawal of 10 MGD. Silver Lake cannot even supply half of that amount. Brockton’s consultants knew this in 1928 when they advised the City to seek additional sources. Brockton’s consultants knew this in the 1950s when they again urged the City to find additional sources or else they would face water shortages. In 1964, Brockton and everyone else got a first-hand look at how dangerous their practices were when they drew Silver Lake down by over 100 inches and had to completely stop drawing water from the lake for several months. This emergency prompted the formation of a Special Commission to find more water for Brockton. This Commission stated that Silver Lake couldn’t supply more than 4.5 MGD. Despite extensive local protests, the Commission’s report eventually lead to an emergency legislative action (Chapter 371, 1964) that allowed Brockton to divert water from Monponsett Ponds (Halifax) and Furnace Pond (Pembroke) into Silver Lake to expand their water supply since EVERYONE knew that Silver Lake could not provide all of Brockton’s water demands. The Special Commission had even suggested that connecting Brockton to the MDC (now MWRA) would be a better solution, but that it would take too long to address the existing emergency. Ultimately the dire emergency of Brockton’s water shortage required the quickest possible fix and the 1964 Legislation was passed. EVERYONE knew that these water diversions would have negative impacts on all of the water bodies. EVERYONE knew that it was a stopgap measure which still wasn’t enough to permanently solve Brockton’s water needs. In 1974, Camp, Dresser & McKee were hired to investigate the existing water supplies and needs. They determined that Brockton still didn’t have enough water to survive through a drought. In 1982 and 1986, Massachusetts had to enact water supply emergencies because Brockton had drawn Silver Lake down by as much as 22 feet! Once again the hunt was on for more water. Once again, MDC (MWRA) connections were recommended. The solution this time was to build a desalinization plant on the Taunton River that can supply Brockton with about half of its water needs. Since the plant was built it has only supplied about 3% of Brockton’s water. Time of year: No diversions in the summer when there are recreational uses. Water level: No diversions when the ponds are low. Water quality: No diversions when water quality presents a public health risk. In addition to the horrendous water quality, Monponsett and Furnace Ponds are extremely low right now. This is partially due to the drought and partially due to management of these water bodies earlier in the year. As a result, the water diversions are not allowed and Silver Lake is carrying the full weight of Brockton’s demand, even though EVERYONE knows that it can’t. So here we are – in a situation that should surprise NOBODY. Brockton cannot claim surprise. They track water levels and water quality every day. They can choose to use the desalinization plant but they are not (in 2016 the plant has supplied less than 7% of Brockton’s water). MA Department of Environmental Protection (DEP) cannot claim surprise. They have been studying the water quality issues in Monponsett Pond for years! In fact DEP recently prepared a draft report about the terrible Monponsett water quality. They will be given a public presentation of those finding on December 15th, we urge residents to attend and ask questions: Mass DEP > Monponsett Ponds Draft Phosphorus TMDL Public Meeting. The study found that Monponsett Pond nutrient levels are more than 300 times what they should be, which is fueling these dangerous cyanobacteria blooms. Unfortunately DEP hasn’t said that Brockton can’t dump that nasty water into Silver Lake. Even though EVERYONE knows that will lead to further degradation of Silver Lake. DEP also requires Brockton’s annual reports. In the 2015 report Brockton reported that over 30% of their water use is unaccounted for!! That’s 1,183,400,000 gallons of water. They don’t know where nearly 1.2 BILLIONS of their water went last year? We don’t know what the regulatory response to this is. We can only assume that DEP will take severe measures to ensure protection of the resource especially in light of the drought. DEP also produces the list of “impaired waters” in MA, for the EPA as required under the Clean Water Act. According to DEP’s assessment Silver Lake is impaired for “Fish, other Aquatic Life and Wildlife”. They also list that the Jones River flowing out of Silver Lake is impaired in terms of Aesthetics, Fish and Wildlife, and Recreational contact. The specific impairments include low dissolved oxygen, excess algae growth, turbidity, and others. DEP cites the “source” of all of these impairments as “Flow Alterations from Water Diversions”. That’s right. The Jones River suffers from all of those things for one very specific reason – not the drought, not Kingston’s water use, not climate change, or roads, or stormwater, or acid rain, or the price of tea in China – it’s because Brockton takes too much water out of Silver Lake. Mother Nature can’t fix this. So who will? The City of Brockton? MA DEP? The Water Resources Commission? The Legislators? Representative Tom Calter has already held public information sessions and has promised legislative action if Brockton and DEP do not address the issues by the end of 2016. The Jones River Watershed Association has been working on this for 30 years, we and EVERYBODY know that these essential resources of the Commonwealth need to be restored NOW. Want more information or want to get involved? Contact Alex or Pine at JRWA info@jonesriver.org 781-585-2322.